Have you ever had that feeling while you were traveling that you forgot to do something before you left the house? Took out the garbage – check; turned on the alarm – check; adjusted the thermostat – “Oh no!” It is upsetting to realize that you are spending money to heat or cool your home while you are away on your vacation. With the Lux Geo 7-Day Wi-Fi Programmable Thermostat you can easily change the temperature anytime from anywhere. It is estimated, that if used properly, programmable thermostats can save you 10-20% on your heating and cooling bills. If you spend a good portion of your day out of the house, shifting your temperature up or down by a few degrees will lead to noticeable savings on your bill. In the past, thermostats could be a little daunting to program. However, the Lux Geo 7-Day Wi-Fi Programmable Thermostat is easy to install and is even capable of working with your Amazon Alexa so you can control your home comfort with your voice! Simply download the LUX mobile app, set up your account and then in the Amazon Alexa mobile app menu under Skills, search for LUX Products and click enable. In the Alexa mobile app under Skills, clicking into the LUX Products Skill will show the proper phrases for using voice commands with your LUX/GEO thermostat. In the app you can also use the Radius® geofencing feature to automatically save energy. This feature allows you to set your “away radius.” Once you get closer to your home, the system will turn on to bring your home to the optimal temperature. This way, if you have a varied schedule, you don’t have to set a specific away time. 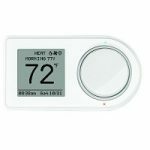 The Lux Geo 7-Day Wi-Fi Programmable Thermostat just made it a lot easier to save energy and money on your heating and cooling costs.